Why do people take part in extreme sports? Are you a risky person? Have you ever tried taking up any of the adventure sports which are a huge craze today especially among young generation? What makes extreme sport athletes set their life on a chance? For most people who participate in extreme sports it is an inexplicable indulgence that ordinary people cannot understand. There is something in these activities that attracts both men and women to take that plunge. Studies say that extreme sports evolved as a reaction to the increasingly safe life. As daily life lacks risks, a common man feels the need to experience the thrill in risk-taking. Many of us take precautions whether at home or outdoors. Extreme sport athletes on the other hand are always putting their lives on the line every time they step outside. Even when they are idle, they are busy plotting their next big risky adventure. Have you ever felt the pump of adrenaline sitting in a roller coaster? This is what drives extreme sport athletes and makes them to be daredevils. They love the adrenaline rush that comes with the act of participating in an adventure sport. Extreme sport athletes feed on the competition and the respect that comes with being able to overcome the hurdles of each event. They set the bar higher each time focusing on the goals that they strive to achieve. The worldwide spread of extreme sports is attributed to the media. Television and movies have been responsible for gaining a widespread participation in extreme sports. People take part in thrilling sports activities for publicity. They get an opportunity to appear on television by participating in extreme sports game shows. Extreme sports comprise sport activities which have an element of adventure. They are popular among those brave ones who crave for thrill and excitement. «Extreme sport» is a name given by the media to the activities which involve danger. They often include speed, height, or physical exertion. These activities can be in the form of thrilling stunts. Such extreme sports covering all kinds of madcap activities like snowboarding, rock climbing, surfing, racing, skydiving, paragliding, skateboarding, and others have become popular last twenty years. Now let’s have a closer look at some of them. Snowboarding is the fastest-growing winter sport. It’s catching on all over the world and now is included in the Olympic Games. Snowboarding is also a way of life, with its own equipment, style, music and even language. 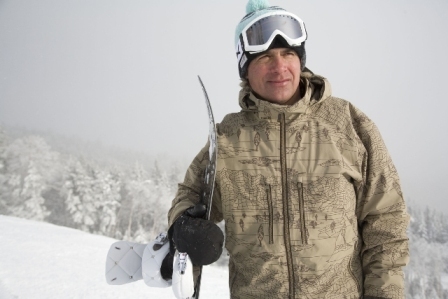 The ‘father’ of snowboarding is Jake Burton. He became hooked on the idea when he was a teenager and took 15 years to create a perfect snowboard. Now he owns the largest snowboard business in the world. Snowboarding is different from skiing. “The only thing skiing has in common with snowboarding is the snow”, says one snowboarding fan. Many people believe it’s easier for you to learn snowboarding when you didn’t ski before. A snowboard looks like a big skateboard without wheels. While standing up with both feet on a board, a snowboarder slides down a slope, controlling the direction with the same small movements that a skateboarder uses. The most difficult thing is, of course, to keep balance. Skiers, however, aren’t happy about the latest craze. They say that snowboards ruin the surface of the snow and that snowboarders frighten them as they fly down hills at amazing speeds. But snowboarders will give you a long list of reasons why snowboarding is better than skiing. Simplicity to ‘ride’, the only equipment you need is a snowboard which you can carry on your shoulders. Because you don’t need poles, your hands are free – so you can wave to friends, take photos and throw snowballs. Easy to learn: you don’t need to be as physically fit to snowboard as to ski. The first thing is to learn how to stand up, then to keep balance. Also, if you fall, you are less likely to hurt yourself and you don’t have to crawl back up the slope to pick up your equipment. Comfort: snowboarding boots are soft, light and comfortable. Also, you can wear whatever you want – but the looser and brighter the clothes, the better. Flexibility: unlike skiers, riders don’t care whether the condition of the snow and the slopes is good or not – they can snowboard on almost any snow-covered surface. 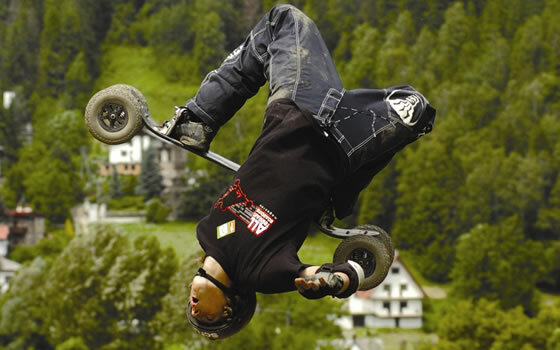 Mountainboarding is a fairly new extreme sport gaining massive popularity in Cornwall, the UK. All terrain or mountain boarding is all about getting down a hill having fun. Riding something similar to a long skateboard with four wheels with pneumatic tyres, you strap in and roll down everything from a gentle grass slopes to urban streets. The riding sensation is somewhere between snowboard, surf and skate, with the benefit of being able to ride on any surface. Although a lot of riding takes place in woods and fields, a large number of mountain board centres have opened across the UK and the rest of the world in recent years. Many of these centres hold fun days and regional competitions where you will see riders performing tricks borrowed from snowboarding, and some new ones specific to ATB. ATB is very easy to do and if you would like to try boarding you can visit one of these centers which are suitable for beginners. All terrain boarding is also perfect for kids. All centres have a wide range of boards, including kids’ models and all have nursery slopes to get you started. Tom Kirkman from Calstock in Cornwall is pretty good at most things he tries. Whilst having a laugh, Tom has become one of the most influential riders in the world. Often introducing new tricks he has pushed the sport's freestylers to new heights. He has also been the fastest rider on almost every boarder cross event he attended in the last couple of years. Why don't you share it with your friends on social nets? Эта запись написана автором Елена Шрамкова, 01.04.2016 в 01:56, и размещена в категории Топики. Следите за ответами на эту запись с помощью RSS 2.0. Вы можете написать комментарий или разместить обратную ссылку на своем сайте.